21CRYPTOS featuring Blockchain For Good ! The San Diego Live Well Blockchain Forum in association with UC San Diego on May 18 and 19 was a two day event, split between a panel talk and networking followed by a series of workshops and a hackathon. Over 100+ people attended the panel conversations — a mix of current students, graduates, and the local entrepreneurial and tech community — all keen to share ideas about the different initiatives they were working on. Blockchain For Good founder Cecile Baird and advisor Jens Albers (CEO of Decentrl) took to the stage with a presentation on BC4G’s 10 Guiding Principles, introducing blockchain and discussing how decentralised technology can benefit a range of social impact initiatives. One of the key points was a prediction that successful next generation businesses will be those with a clear purpose; that can balance the needs of people and the planet with profitability. Using the blockchain we have an opportunity to rethink systems and business models. Jens explained how he believes regulation follows innovation; a particularly pertinent message given the increased scrutiny that blockchain companies face in the US. Ideas, he reasoned, know no boundaries; so innovators and entrepreneurs shouldn’t feel compelled to self-impose any when working in blockchain technology. Jens and Cecile also reiterated Blockchain For Good’s continued interest in supporting more businesses in the social impact space — and announced that not only would the company be offering a $5,000 prize fund to the hackathon winners, but they’d both be acting as mentors to those who were accepted into the UCSD incubator program, which will run across the next few months. Starting as they meant to go on, Cecile and Jens remained at UCSD for the duration of the hackathon, mentoring participants through feedback sessions, workshops, and discussions. It was a great opportunity for them to contribute to an already vibrant blockchain community, and to offer the benefit of their individual experiences. Four teams emerged victorious; each very different to each other, but all focused on using the blockchain to help tackle crucial real world problems — homelessness, the distribution of solar power, art licensing on blockchain, and countering fake news. Each team consisted of five students, who will all return to take part in the Live Well incubator. It’s encouraging to see that there’s so much interest and support for using blockchain technology intelligently — for the greater good! SAN FRANCISCO: Blockchain For Good Panel at Token Fest! BC4G is an expert advisor to the All Party Parliamentary Group on Blockchain, and spoke out first on a topic that was missing on the agenda: Charities and NGO. Since our input, the APPG Blockchain have included Charities & NGOs as a blockchain topic area, the evidence meeting will be held in June 2019. The mission of the All-Party Parliamentary Group on Blockchain (APPG Blockchain) is to ensure that industry and society benefit from the full potential of blockchain and otherdistributed ledger technologies (DLT) making the UK a leader in Blockchain/DLT’s innovation and implementation. The APPG Blockchain brings evidence, use cases and future policy scenarios while considering industry and societal implications as well as environmental opportunities. (...) "Cécile Baird, one of the founding partners of Blockchain For Good and a communications consultant for blockchain startups, says that the value (and volatility) of currencies like Bitcoin and Ether have essentially distracted people from the human values the developers of blockchain technology are trying to emphasize. Much like Gutterman said, Baird believes that instead of focusing on growing their bank account, people in the space should focus on how they can apply these technologies to improve the world. One of the most critical applications of blockchain is going to be how we collect, store, use and sell our personal data. Baird sees a future where consumers own their data, which will be kept securely on a blockchain, and sell it off at their discretion, as opposed to the model we have now where we willingly give our data over to banks, Internet Service Providers, corporations like Apple and social media sites like Facebook so they can distribute it at will. Gutterman, too, offered this as one of the most revolutionary uses of the blockchain." "Blockchain has been heralded as the next big thing in the social sector and has fast risen from emerging trend to a disruptor in the development and humanitarian space alone. But can it really address some of the social and environmental challenges we’re facing? In this meetup we’ll explore the role of blockchain technologies in helping to address the world’s challenges. We’ll hear lightning talks from ‘blockchain for good’ pioneers, before breaking into a panel discussion around whether this tech offers hype or hope. 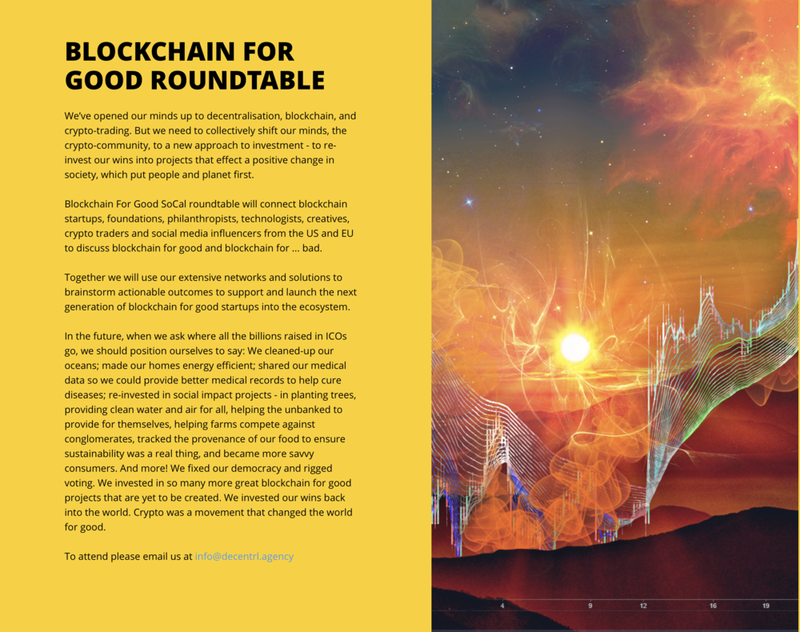 We’ll be asking how social impact ventures, NGOs and charities can capitalise from the use of blockchain to deliver on their social and environmental agendas, and which applications of distributed ledger technology are already having the biggest impact. Join us on 14 November at Techspace London in Shoreditch to find out. Confirmed speakers: Cécile Baird, Founding Partner, Blockchain for Good (BC4G) | Raphäel Mazet, Founder and CEO of Alice.Si | David Shepherdson, Director of the not-for-profit company developing HullCoin." INNOVATE 2017 is a two day conference hosted by Innovate UK the UK government’s innovation agency. The conference will explore the major themes brought about by the pace and complexity of our world and discuss what that means for the individual, business and governments. From Robotics to Urban Planning INNOVATE 2017 will deliver fresh perspectives on innovations such as artificial intelligence, smart cities, alternative food sources and space exploration. BC4G will be representing Blockchain on the Equality Across the World panel. Technology has been responsible for much of the rise in inequality- but could it also be a part of the solution? How can we ensure innovation benefits everyone? Joining the panel will be Min Teo, Director-Fundraising, Techfugee, Ella Goldner, Co-founder, Zinc VC, and chaired by Priya Guha Ecosystem GM, RocketSpace. CapitOx is one of Oxford University’s leading finance societies and each year the society holds a conference focusing on a range of issues. This year, they are holding a panel discussion on Blockchain to discuss what are the financial and social implications of Blockchain technology and BC4G’s Cecile will be there to join in on this panel discussion! We've teamed up with Blockchain Live to curate a panel on Blockchain For Good! Read our latest article in CoinDesk. In this opinion piece, we argue that we need a duty of care today, for a humanised blockchain future tomorrow. We summarise our key messages from our larger report on a Blockchain utopia... and dystopia. Blockchain for Good (BC4G) and STOP THE TRAFFIK is forming a coalition to harness the power of people and emerging technologies such as blockchain to shine a light on modern slavery and generate systemic disruption at all levels. Look out for our article in arts magazine Faux Pas on “How blockchain can transform the fashion industry” coming out in April and available in bookstores in the UK, Europe, USA and Canada.